A very useful way to visualize time to failure for a specific material is with the S-N curve. The “S-N” means stress verse cycles to failure, which when plotted uses the stress amplitude, σa plotted on the vertical axis and the logarithm of the number of cycles to failure. 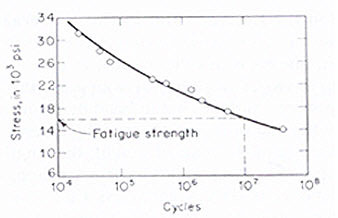 An important characteristic of this model as seen in Figure 3 is the fatigue limit. – Instruct the user to inspect the part periodically for cracks and to replace the part once a crack exceeds a critical length. This approach usually uses the technologies of nondestructive testing and requires an accurate prediction of the rate of crack-growth between inspections. This is often referred to as damage tolerant design or “retirement-for-cause”. This entry was posted in Fatigue. Bookmark the permalink.